Discussion in 'One Piece News' started by kazuko.i, May 9, 2014. News surrounding the upcoming Taiwanese version of the One Piece Exhibition -One Piece Ten- has been revealed. According to Japanese news website natalie.mu, the One Piece Exhibition will be revealing a new Dressrosa Arc-inspired display focusing on the theme “The Light and Darkness of Dressrosa” showcasing the past, and future, of the Kingdom of Dressrosa. 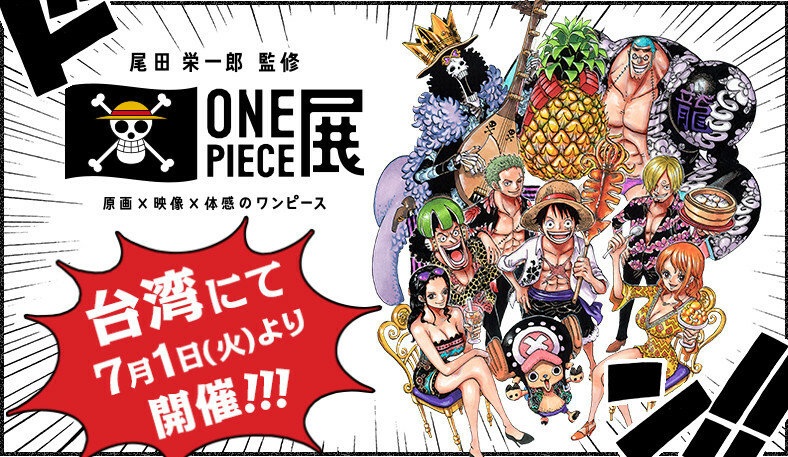 The exhibition will be held from July 1, 2014 until September 22, 2014 and is the third edition of the official One Piece Exhibition supervised by manga artist and creator Eiichiro Oda. The previous Tokyo and Osaka edition of the One Piece Exhibition have amassed over 800 000 visitors. 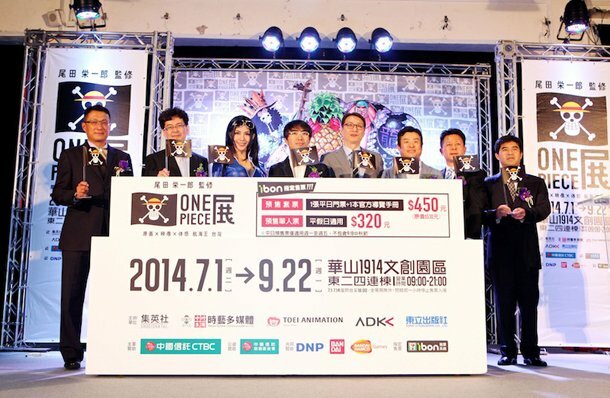 Tickets for the exhibition are now also available for pre-purchase on the Taiwanese ticket system “ibon”. Note: Chief Editor Heishi is the man standing on the right in the picture. rio: There's a possiblity that we'll have another bounty revealed, in the past exhibitions we had Ace's and Bepo's. But you can make a long list of those big names whose bounties havent been shown yet. art gallery looks like you can spend a day watching them . SHs bounty might rise after dressross in manga,so not expecting. though if Sabo's current bounty is disclosed that would be awesome.. I guess it wont be any popular characters in recent manga. 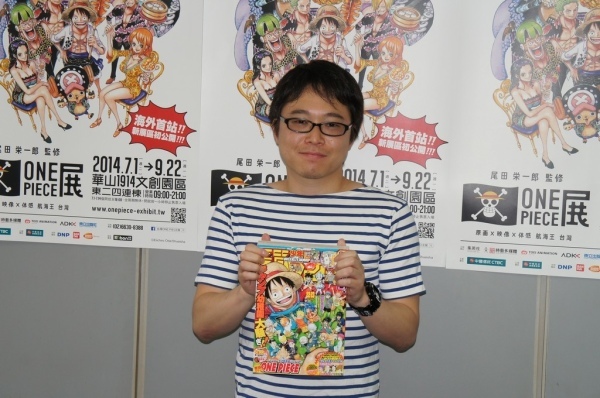 Interview of OP's editor, Kohei Ohnishi. In general, why this exhibition's gonna be held in Taiwan is because of the high popularity there. This exhibition has a new area exclusively for Taiwanese that's never been shown before which is mainly focused on Dressrosa Arc and Doflamingo (Dressrosa's Light & Dark). Oda says not only that added area, the whole content would be better combined with music and animation instead of just pictures. Oda has checked everything that's gonna show in the exhibition and he's quite satisfied. The most amazing thing is a theatre where four projectors work together and audience can enjoy as well as re-take the Straw Hat's journey and adventure. Oda is very interested in fashion, like dressing. LOL. Because he's never been to Taiwan before, after he looked at some images of Taiwan, he drew the poster (above) with stylish clothes that fits the impression of Taiwan. And Oda's another impression of Taiwan is that there's lots of tasty food. (second that, LOL.) Oda is highly enthusiastic when drawing manga, he's got a good sense of humour and wants everyone around him to be happy. I would want a DF that could make Oda submit the work on time. LOL. (Because Oda normally wouldnt submit until the last minute when he feels it's perfect.) The end of OP has already been decided, current progress is about 60-70% of the whole story. Readers will get to see the final chap in 10 yrs. LOL. I believe that huge pineapple Franky's holding to be a new member? Pineapple is a famous fruit in Taiwan. But did u get my point there? What might be hiding behind it? No, I'm sorry I didnt, I cant find anything hidden behind. That pineapple might represent a new, surprise crew-member, that's what i meant. But it's just a pineapple in the end. Thank you, I'll take that as a compliment. and how much Ace's bounty? Souvenirs that you can buy at this exhibition.